Hello all my fellow gamers and video card performance aficionados out there. 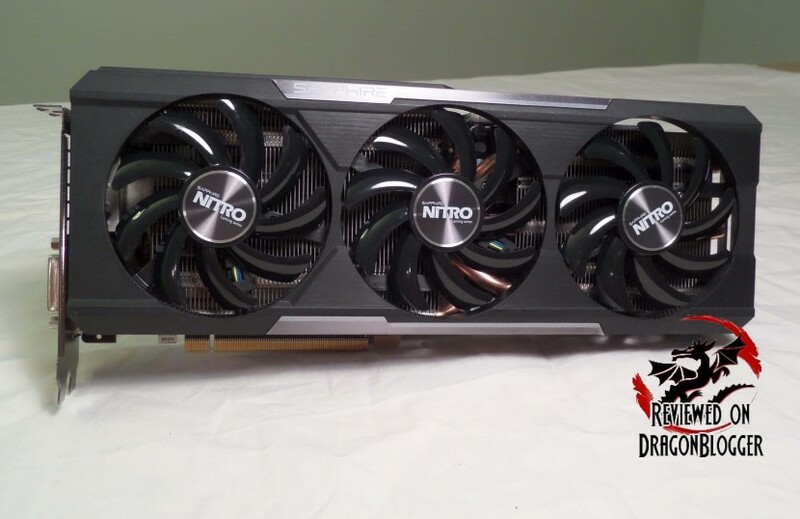 Today I have the pleasure of reviewing for you the Sapphire Radeon NITRO R9 390 8GB GDDR5 Tri-X OC video card. 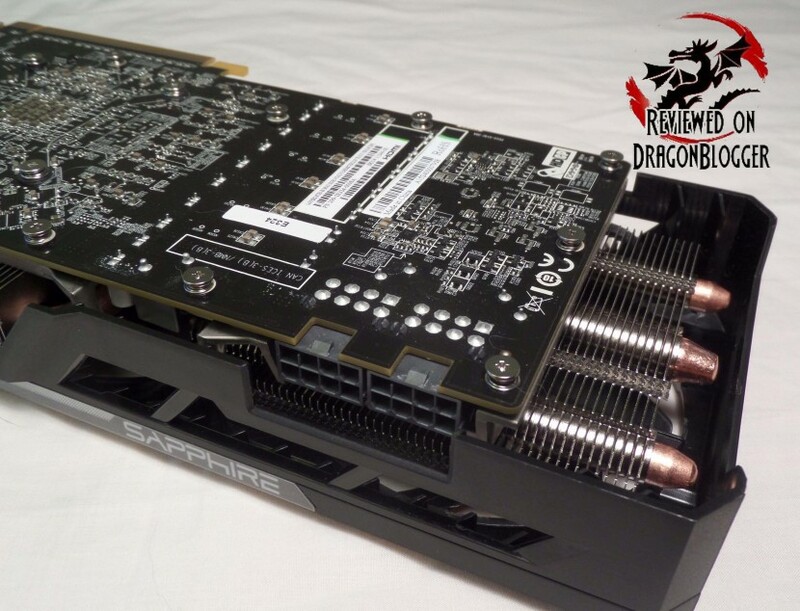 Sapphire being one of AMD’s premiere board partners will surely help to keep AMD’s fire, that was not a play on words and you will see why throughout this review. One other thing about this card, its Sapphire’s latest series, the NITRO series. Hopefully I can help your decision on what video card to buy next. Lots of talk and no card, gets me upset too, so let’s get to the unboxing. You can see here as I mentioned previously, 1 x DVI-D port, then 3 x Display Ports and 1 x HDMI, they give you everything. Unlike many other cards though, it does not bring any sort of converter for power or anything like that, the contents are slim, but it does bring an HDMI cable that is 5.9 feet, drivers and software and manuals. So now I install the card to do some benches, here I show you how to install it in case you don’t know how to and even if you do, you might learn something. Before you get too excited, here are the system requirements, make sure you have these at least. Blue-Ray™ / HD-DVD playback requires Blue-Ray / HD-DVD drive, but who has an HD-DVD drive anymore? 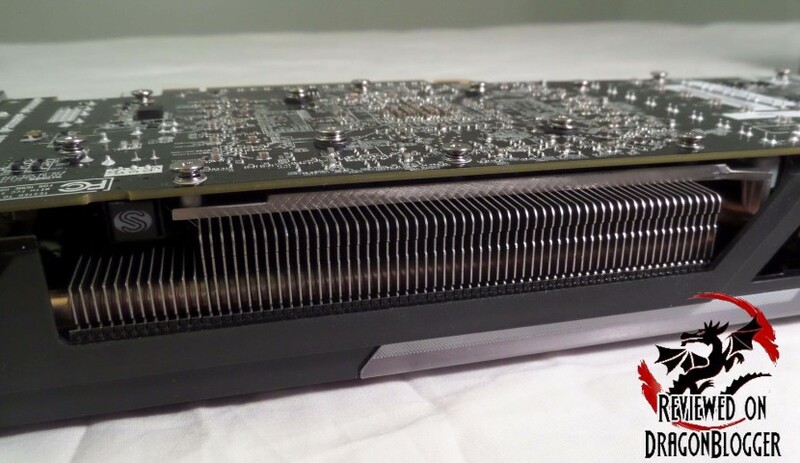 As you may or may not already know, this is a Hawaii based GPU. This of course is the updated version of the Hawaii platform, having more efficient GCN architecture, higher memory bandwidth and better power management. 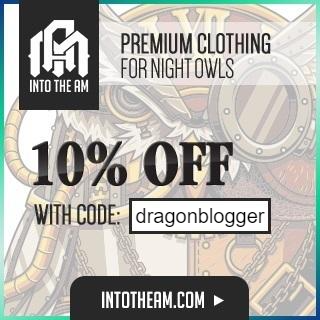 One thing that you may find slightly odd is I am referencing a 1010MHz card, but if you click on any of the links in this review, you will notice that they take you to a 1040MHz card. 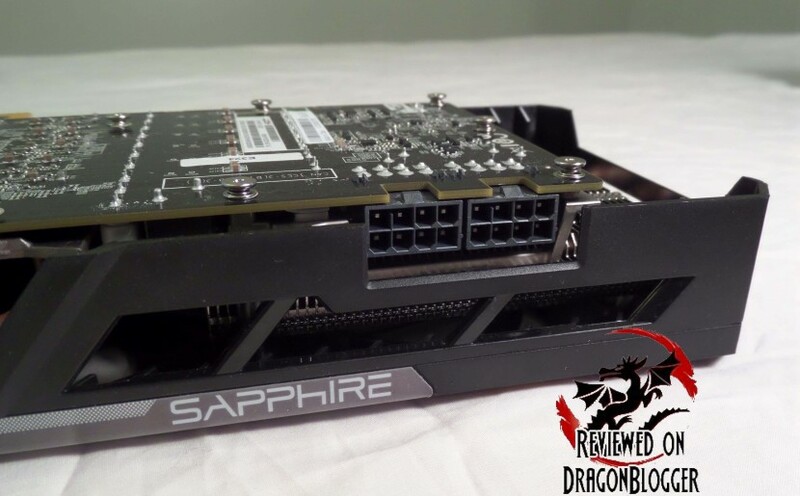 The reason for that is Sapphire released shortly after sending me this card, the slightly faster card which is the SAME exact card I am reviewing here, but with a backplate as well with a lower price tag, so I linked this faster and more affordable card here, throwing you a bone here. So faster speeds, better power management and a backplate should all add up to better temps right? Well, since I don’t have the card with the backplate, I can can’t say for sure, but let’s see what the card I have can do. 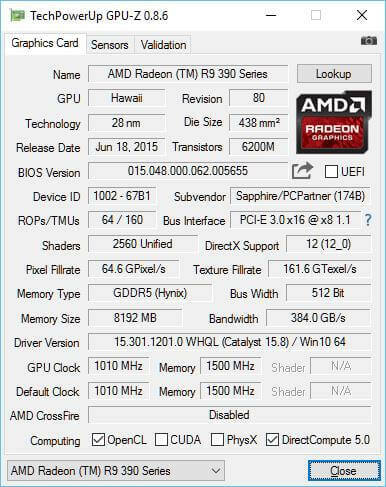 For this review, I am using AMD’s WHQL’ed Crimson Edition 16.1, the hotfix version. First off is 3DMark’s Firestrike, mind you not a game, but it is the staple of GPU testing just to get an idea of how this card holds up. For games, I will be testing Metro Last Light, Tomb Raider and Thief. I will also be giving you some gameplay videos of Grand Theft Auto V and Battlefield 4. Before I start, I wanted to mention that I test wattage consumption during the benchmarks to help you understand what kind of power you might need. 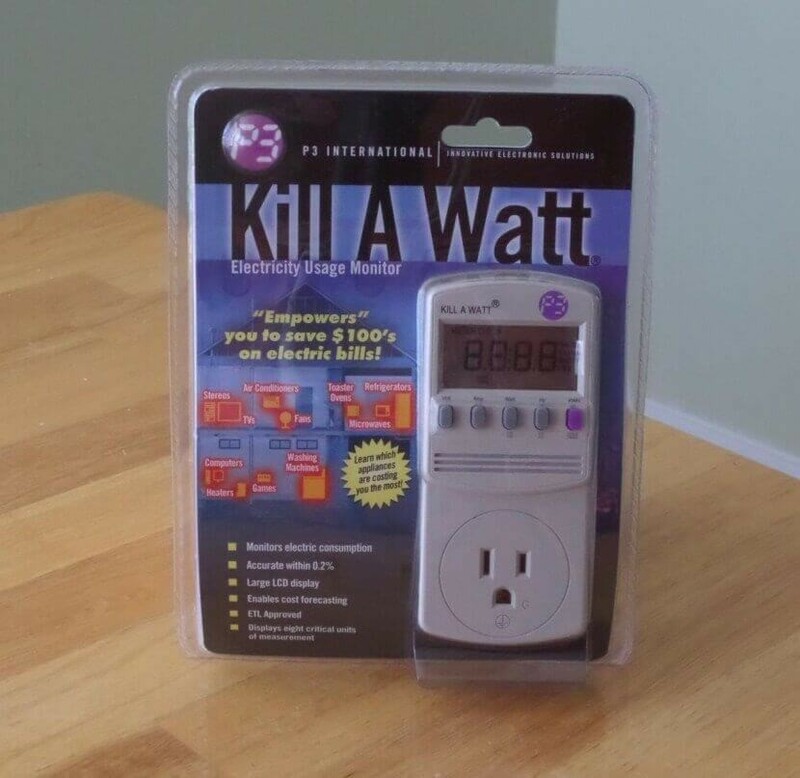 To test the wattage, I use a “Kill A Watt” by “P3 International”. Ok, ok, let’s get to the benches. Not a bad score at all, you can see that it performs 86% better than all other results. If you will notice the maximum wattage reached during this benchmark was 387 Watts and the average wattage consume was 220 Watts. The Tri-X fan system Sapphire has implemented kept this card at a very tolerable 61°C. 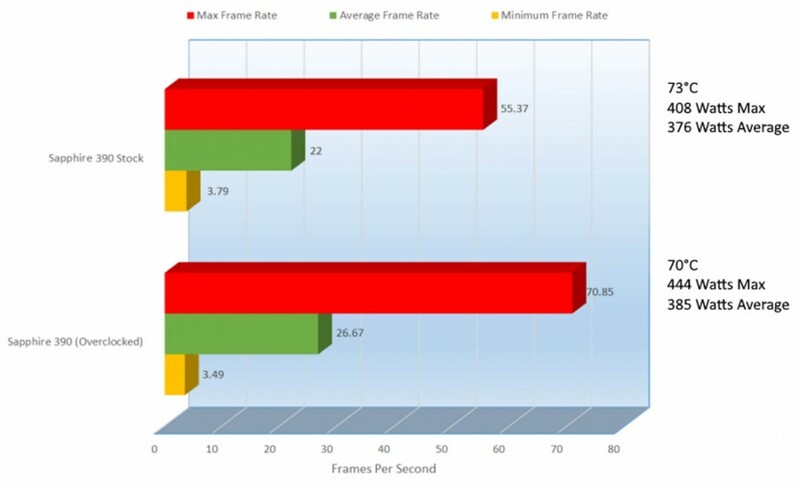 AMD has been known in the past to get real hot, that has not been the case for some time, but let’s not trust the hearsay, check it out here not only in 3DMark, but in the results in the rest of the review. A bit odd though that even though this driver is approved by Microsoft, since it is WHQL certified Futuremark does not approve it. That’s not a bad thing, but something to note. Futuremark will not approve “hotfix” drivers unless specifically requested by the graphics card vendor, in this case AMD and you have to pay Microsoft to WHQL anything. OK, enough with the small talk, let’s get on to some Metro Last Light. The only different between the presets was resolution, 2560 x 1440, 1920 x 1080 and 1280 x 1024, the rest was the same and I will show you all 3 below. No matter how powerful your system is, Metro Last Light is known to torture the best of the best and it seems like that holds true here as well. Even at the lowest resolution benches, the card struggles please note that I have EVERYTHING turned up. 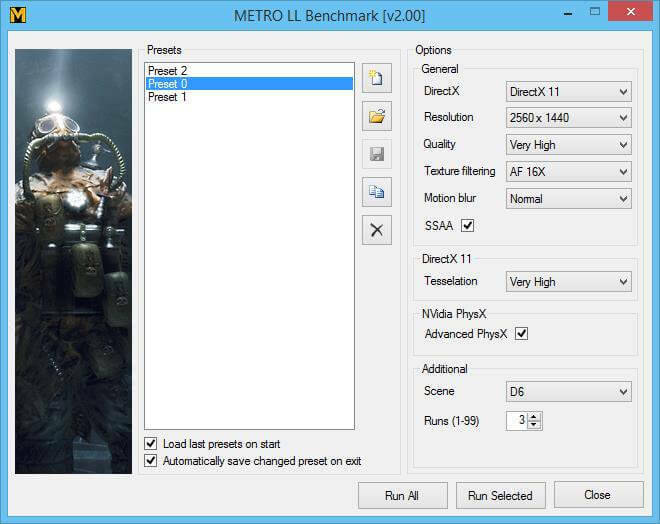 Like in Metro Last Light, THIEF, Tomb Raider, Battlefield 4 and GTA V will have all the benching and gameplay alike, changing only the resolution. 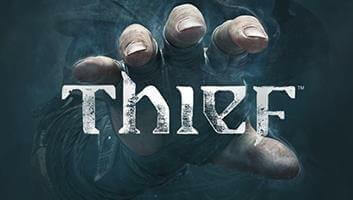 It looks like THIEF took this away, the scores are amazing. At 2560 x 1440 the average frames per second were 51.9 and the highest were 73.9, very playable even at the lower 36.9 and it was very rare that it hit that 36.9 but it was the lowest. So let’s move on to Tomb Raider left all alone on an island, poor Laura. The 390 seems to rock all of these benches, some more than others of course but Tomb Raider fared very well. 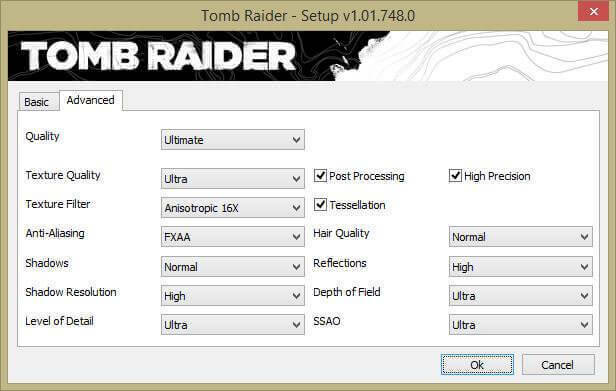 You will notice though I did not select TressFX for the hair so that when I test NVIDIA cards, to keep everything fair but she was just as stunning as ever, even with her hair flowing through her shoulders. 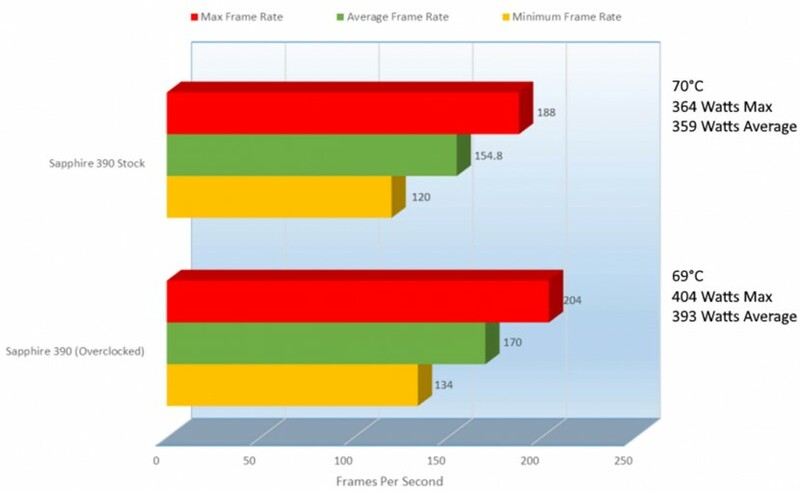 The highest I tested was at 2560 x 1440 even though my monitor can handle 3840 x 2160 but it only plays at 30Hz at that resolution, the Asus PB287Q, a very nice monitor for 2560 x 1440, but I think the 3840 x 2160 was an afterthought. 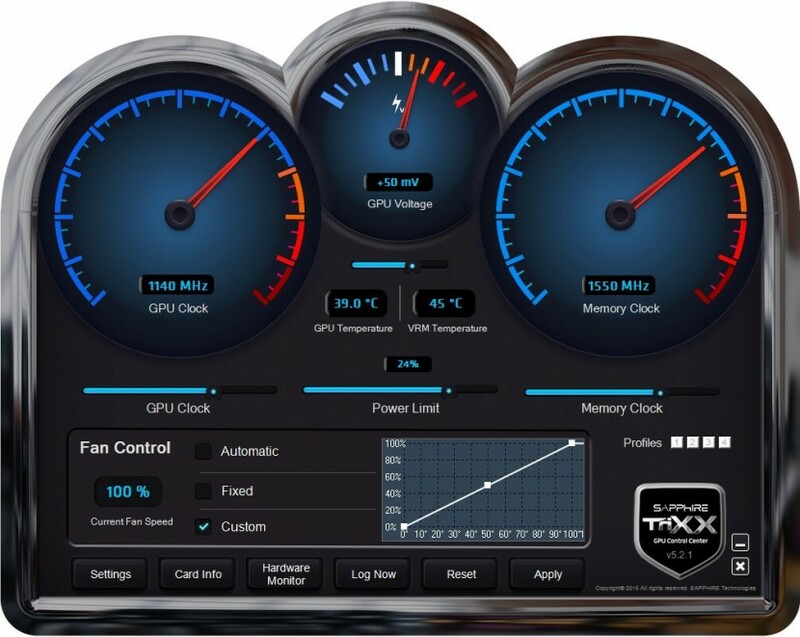 Alright, so usually at this point, I would cut over to an overclock performance test, but it seem that AMD has gotten rid of their AMD Overdrive, at least for GPU’s so I did a little search on Sapphire’s site and found the Sapphire TRIXX OC Utility, but we all know that TRIXX are for kids, sorry I had to. 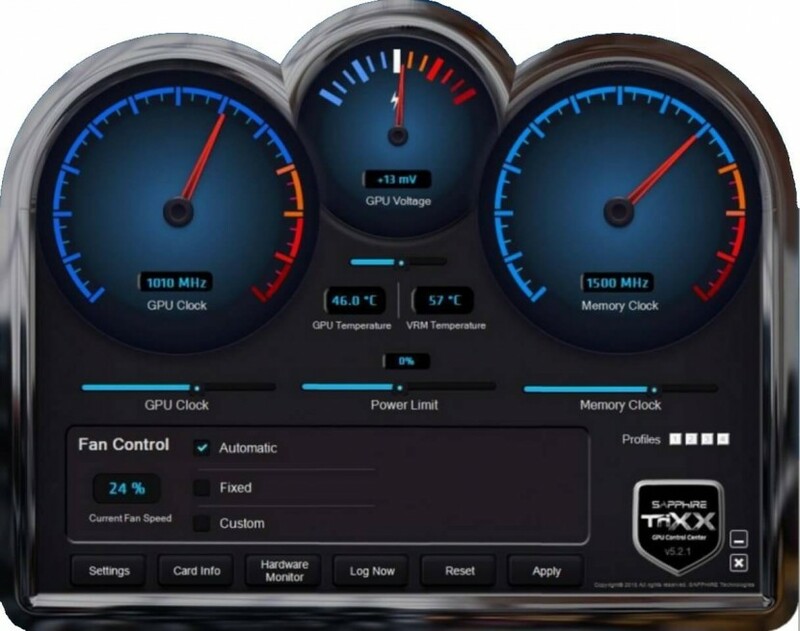 So the TRIXX OC Utility, just like AMD Overdrive allows you to adjust the fan speeds, core voltages, power limits, GPU clock, memory clock and when all is said and done, you can even save the current VGA BIOS. 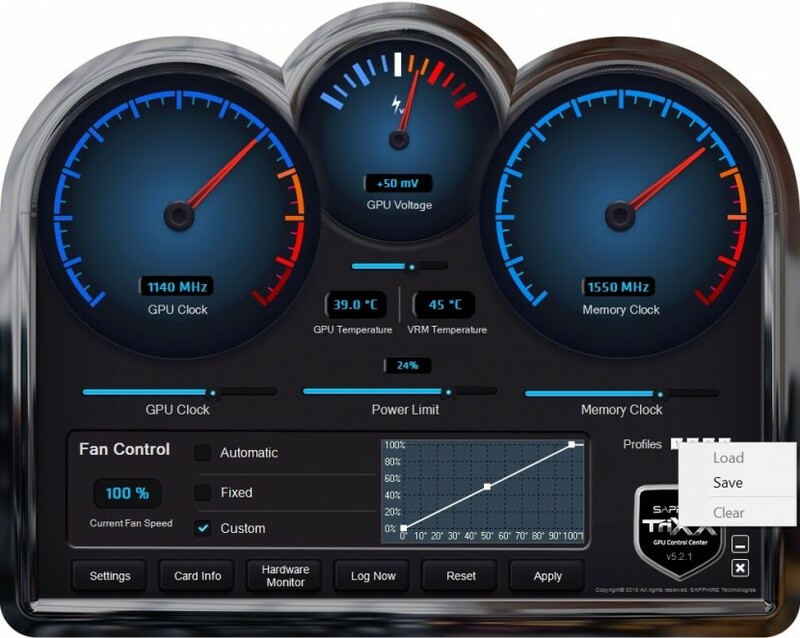 Then it also lets you run a hardware monitor of sorts, so that you can see you Core and memory clocks, GPU temperature, speed the fans are running at, GPU and more. 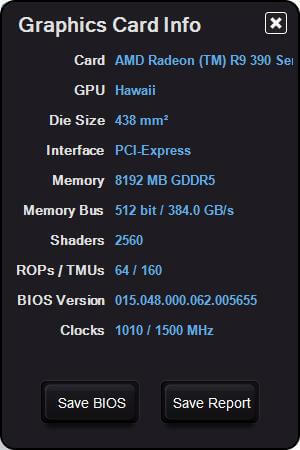 OK, so what kind of overclock did I give it, well check out the TRIXX settings. 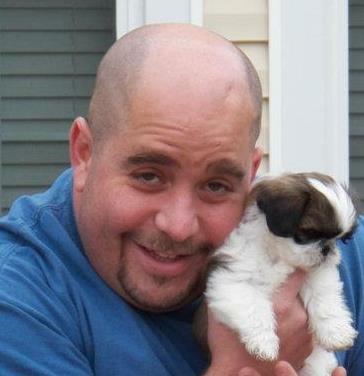 The software allows you to create a custom profile for the fans as well and save them under 4 profiles buttons. 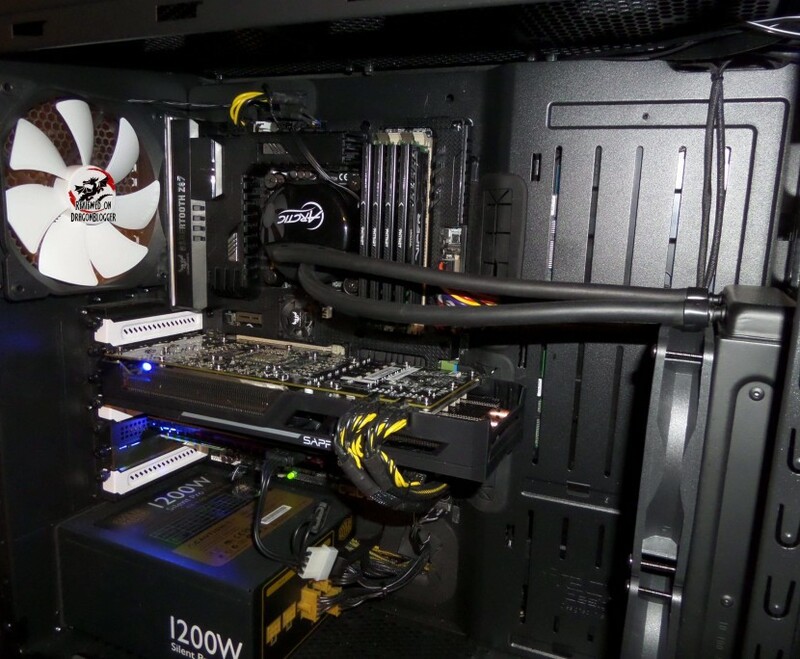 In the picture above, I show you the overclock, as well as the fan profile and 1 of the 4 Profiles you can Save and Load from. I show you below that you can click on the 1 ~4 profile buttons to either “Load”, “Save” or “Clear” the profile. If you uninstall this program and maybe reinstall later, you will lose your saved profiles, so if you like your overclock and want to use it later, aside from saving the profile, take a screen shot of it too. So you can see here, overclocking as I have increased the GPU Clock and Memory of course, but it also increased the Pixel Fillrate, Texture Fillrate and memory bandwidth, very cool but what does that mean for performance, well let’s find out. 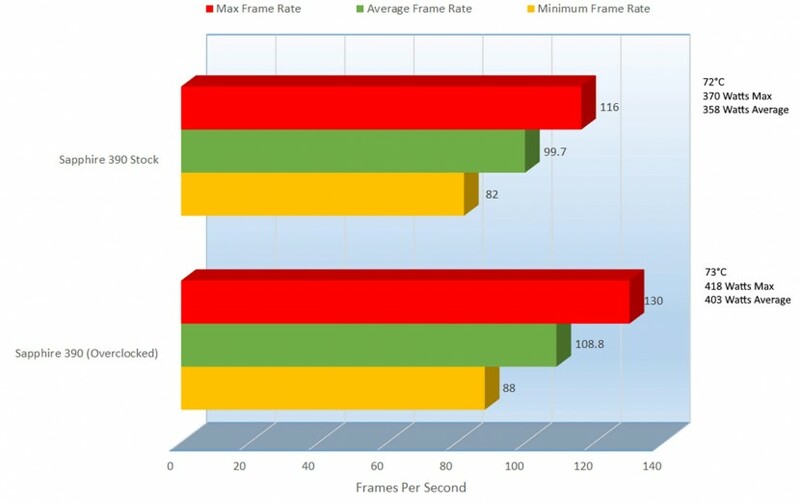 Due to the overlcock we receive a 7.91% improvement in the overall 3DMark Firestrike score. 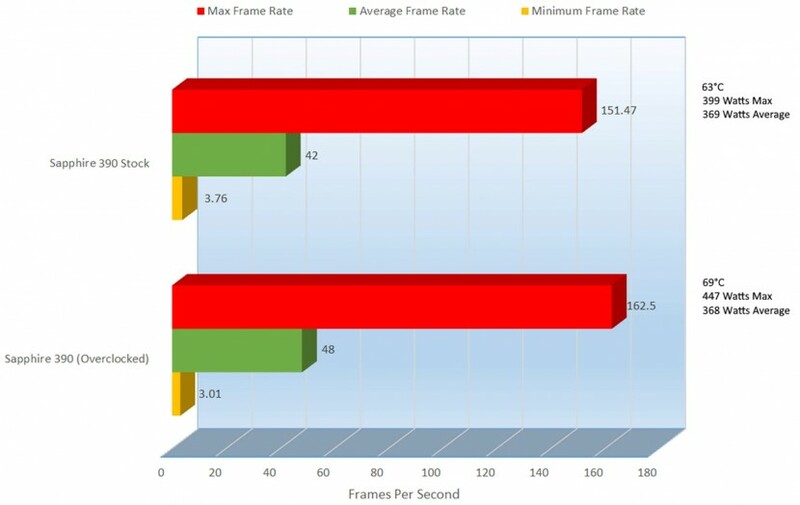 Breaking it down a bit more, we received a 10.67% improvement in Graphics test 1, 9.95% improvement in Graphics test 2 and a decrease in the Physics test by .432, not huge but worth mentioning. The on the combined score we received a 6.53% improvement. Although the performance did go up, it still could not pass it being 86% better than all other result’s. 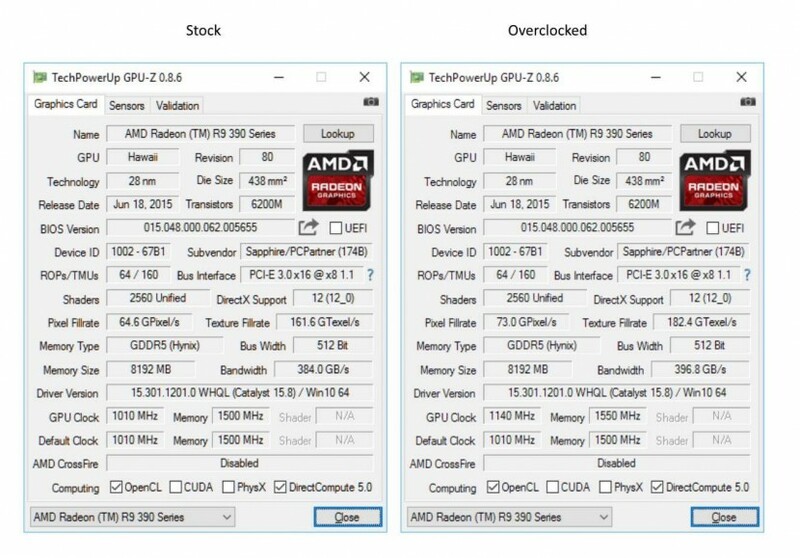 I guess the competition is fierce though the problem with this is that it rates stock and overclocks in the same category. I think maybe overclocks made in general should go into their own category, what do you think? Not a huge improvement, but it was an improvement overall across the board. Only averaging the Average results, we got a 14.29% improvement and with that only a 6° difference. The wattage shot up on this overclock though 12.03% on max though dropped oddly enough on average 0.3%. 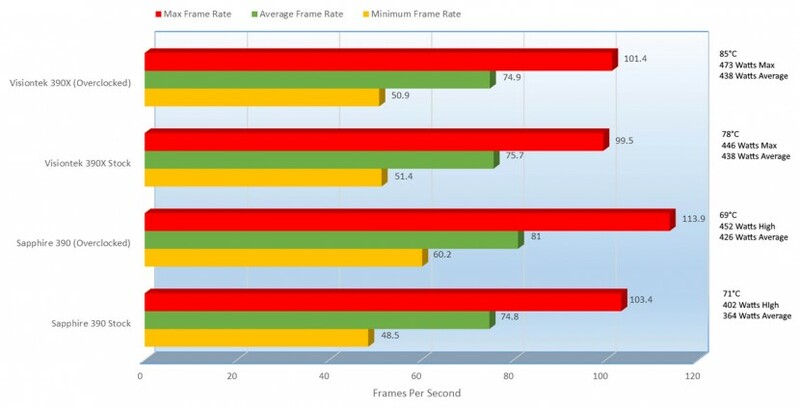 The improvement here was not as high as before on the average only a 7.02% improvement, though the max frame rate went up 43.38%, but you can’t count on the Max. The wattage again shot up 11.57% though only went up slightly on average by 1.85%. Thankfully, it just keeps getting better. The improvement here is 21.23%, a decent improvement here on average and 28.82% under max. As silently as THIEF’s left us at the last bench run, it is back. Let’s see how THIEF fared in the OC biz. It looks like the default fan speeds on this one might have not been as good as the overclocked profile fan settings I placed on here. The wattage increased both in average by 15.07% and max by 7.71%, but hey we are getting an edge right? 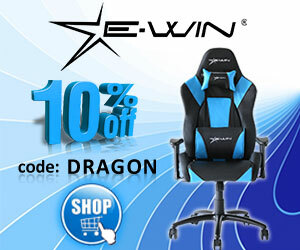 The performance on average went up by 9.20%. 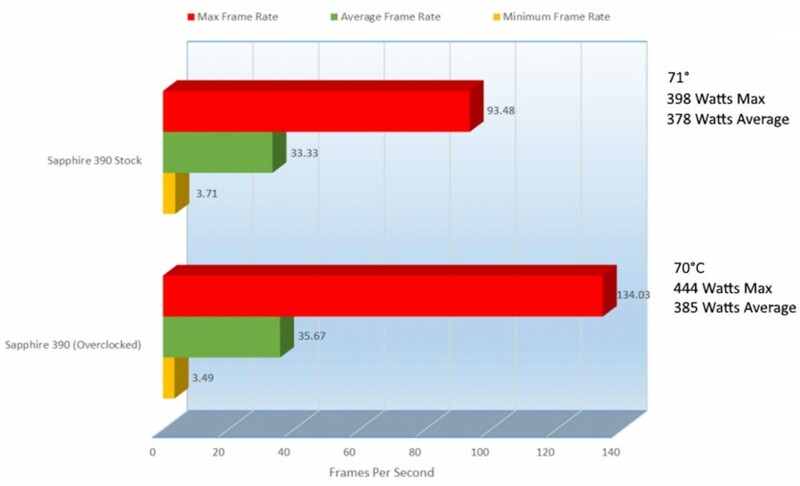 From stock to the overclock we have an 8.29% improvement and a relatively high wattage increase of 17.03%. The performance is getting great here and with that improvement in performance and there is an improvement in temperatures as well, its cooled 2.90% over the stock fan speeds. The average wattage has gone up here by 17.22% but with that improvement the performance of the card has improved as well. 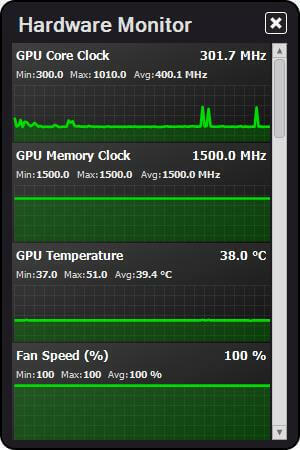 The average has improved by 7.90% but notice that the heat has not gone up or down, the cooling on these cards is nice. Always saving the best for last, Laura comes in to solve a mystery for us, is the additional overclock over the already overclocked card worth it? Performance on this one was already good to begin with but it just keeps getting better. On the average the performance went up by 9.25% though the wattage did go up by 15.27% though the temperature kept steady at 69°C. On average we see a 9.82% improvement and with it a dip in temperature by 1°. Even though the wattage went up by 9.47% the temperature went down, but again it was in the increase in the fan performance. Even at 2560 x 1440 we see a nice improvement in the average FPS at 9.13% only 1°C warmer but we do see a rather large bump in wattage. From stock to our overclock we can see an 8.92% increase in power consumption. Again, these are just benches, let’s see what it looks like within games. How does it play my favorite Battlefield 4. 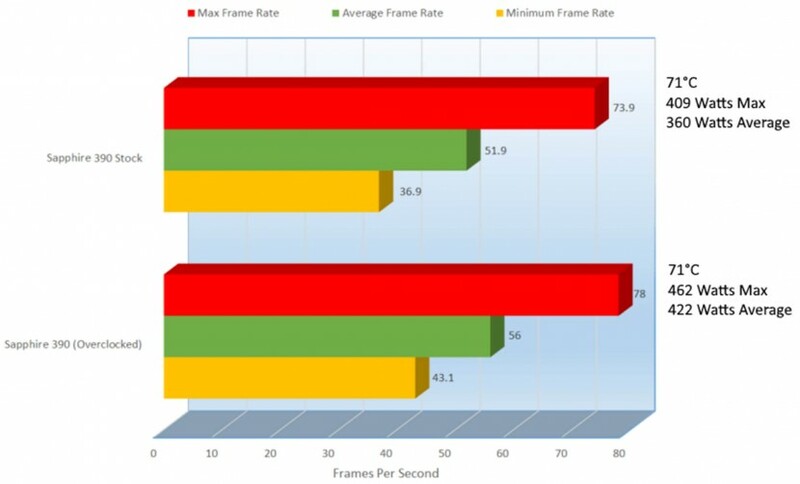 Nice, with everything turned up, we are seeing frames per second in the 90’s, though usually in the upper 60’s and 70’s, so I am very impressed. Next up is Grand Theft Auto 5, some might prefer GTAV, but anyway, let’s check out the game play. This one was a little lower, though still running at max, we saw frame rate anywhere from the upper 40’s to the upper 150’s, I would say it hovered around the 40’s. Unlike many games though, this game runs great in the 40’s very smooth. 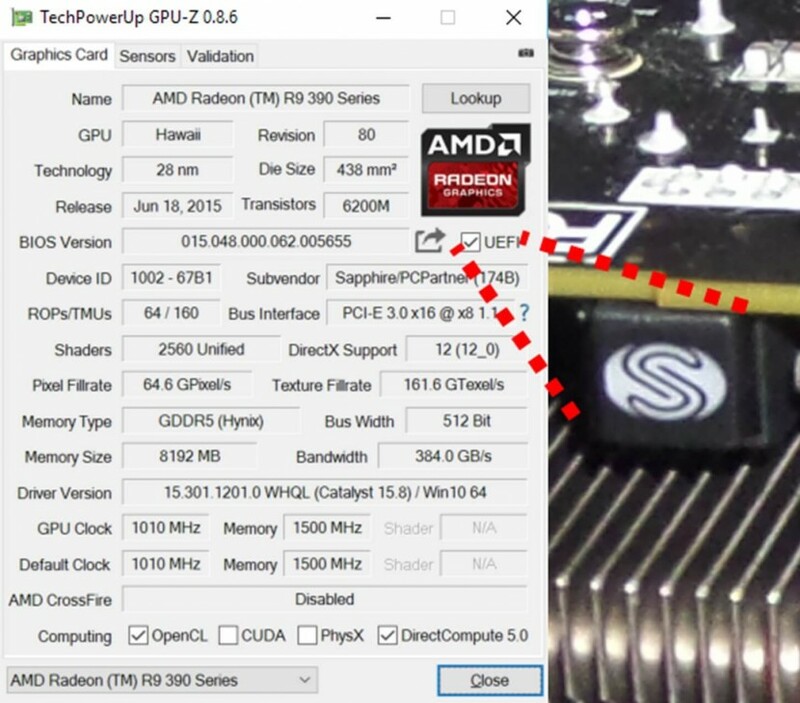 Though I used Techsmith’s Camtasia Studio 8 to edit all my videos, it’s amazing for editing and rendered very nice and quickly these videos, I edited them all on the Sapphire Radeon NITRO R9 390 8GB GDDR5 Tri-X OC without an issue. But anyway, back to the review. So just above the videos, you saw I compared stock versus overclocked speeds, but let’s see how a 390 and a 390X compare against each other. 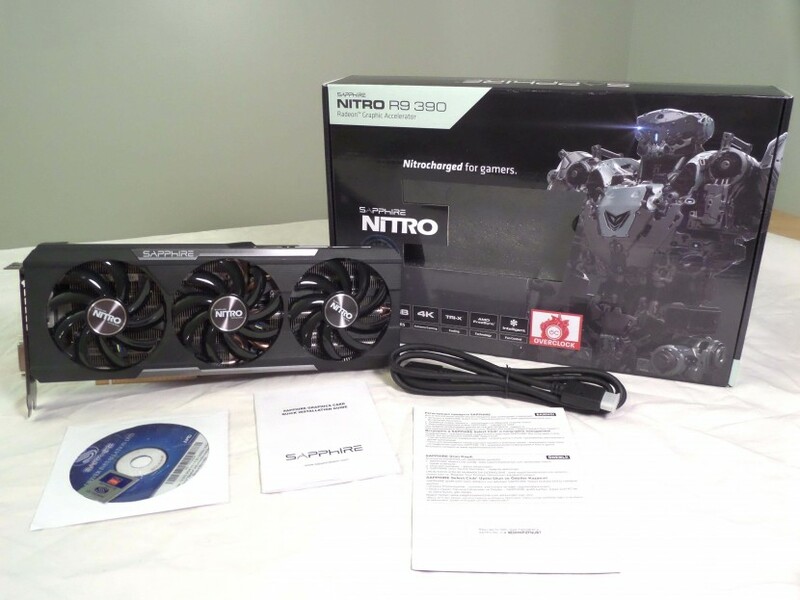 I will be comparing the speeds, temperatures and wattage differences between the Sapphire Radeon NITRO R9 390 8GB GDDR5 Tri-X OC and the VisionTek Radeon R9 390X 8GB. 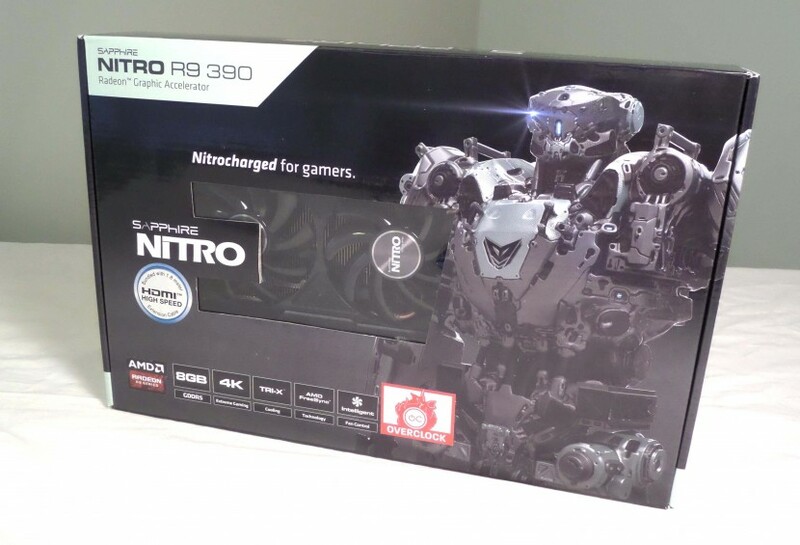 Both great board manufactures and each offering a different flavor, not to mention completely different SKU’s, but these are just comparisons for you to decide whether to get a 390 or a 390X. I would preface the comparison to mention that the scores for the Visiontek Radeon R9 390X 8GB were based off of AMD’s Catalyst 15.15 driver version, the Sapphire Radeon NITRO R9 390 8GB scores are based off of the AMD Crimson Edition 16.1.1 driver version. I would have retested the Visiontek, but I had to send it back to Visiontek, take that as you will. 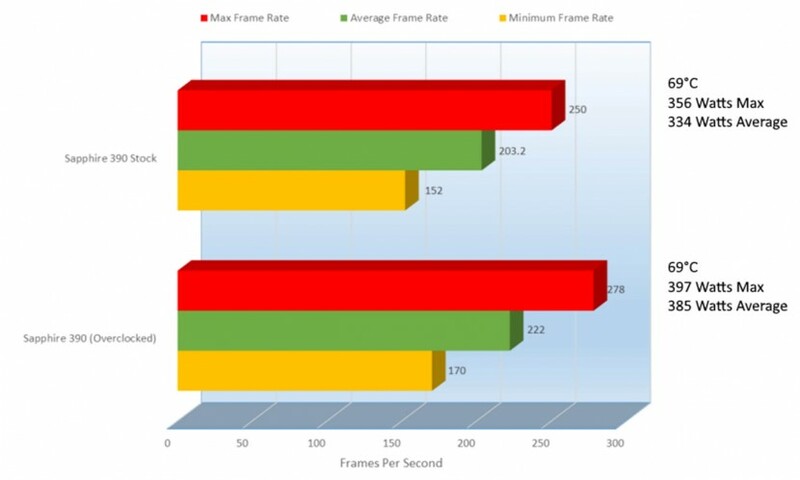 Wait, did I record this incorrectly, but it looks like my overclock on the Sapphire 390 improved performance so much, that it outperformed the Visiontek 390X, that is amazingly impressive. Keep in mind that this is 3DMark and not a game, but this is still impressive. So now let’s check out Metro Last Light. 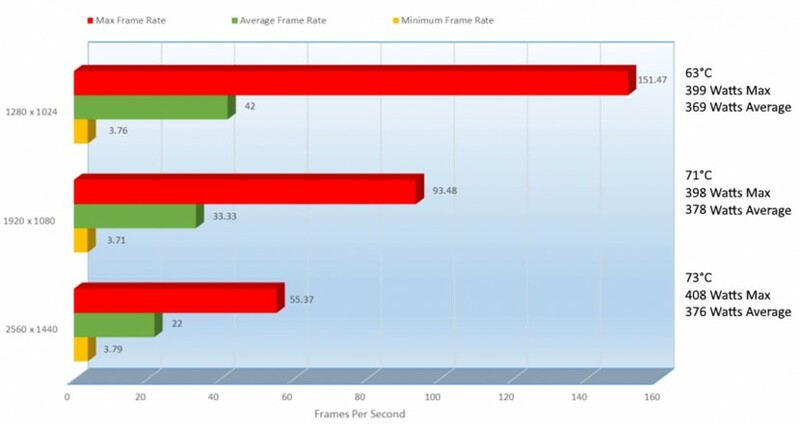 Alright guys, so maybe the 3DMark test was not too much of a fluke. 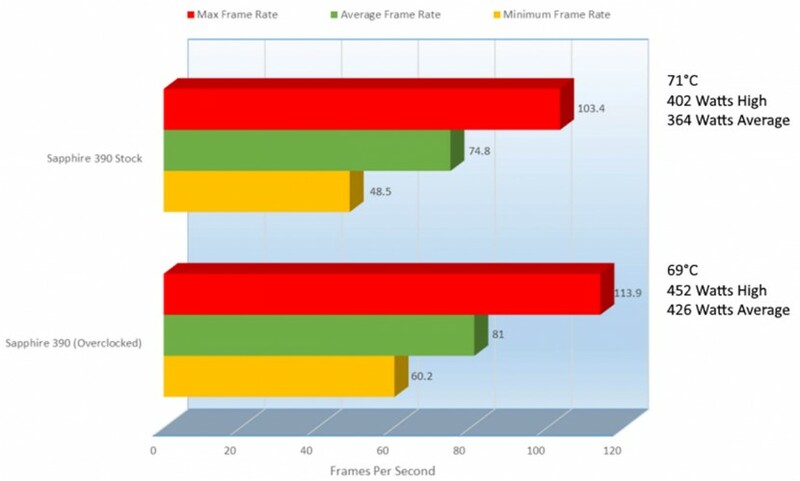 The cards were almost neck to neck in all of the tests; pay no attention to the Max frame rate as that is not a way to measure true performance. 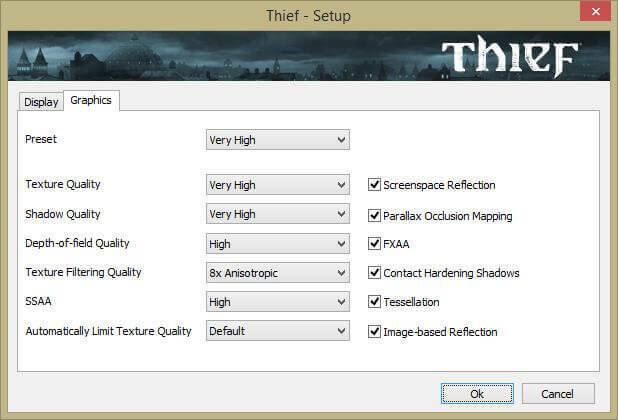 So let’s move on to THIEF. The Sapphire seems to be doing much better than I would have thought. Either this card rocks or the drivers significantly improve its performance. I will get into that a little bit later in the review, but let’s check out what Laura has for us. 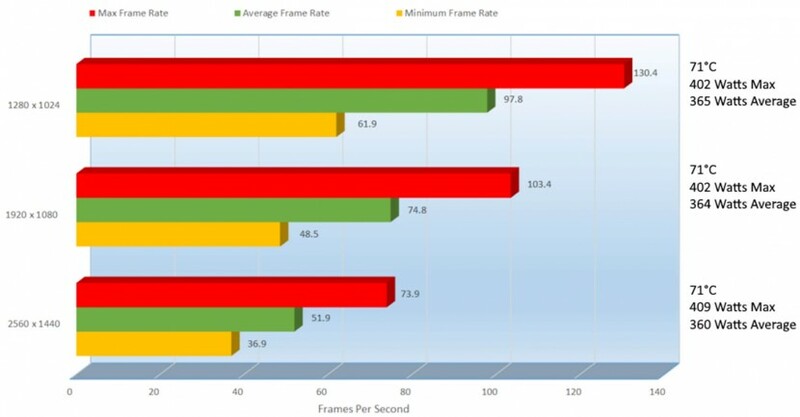 So the Sapphire NITRO 390 does it again, outperforming the 390X, almost entirely in average frames per second again. 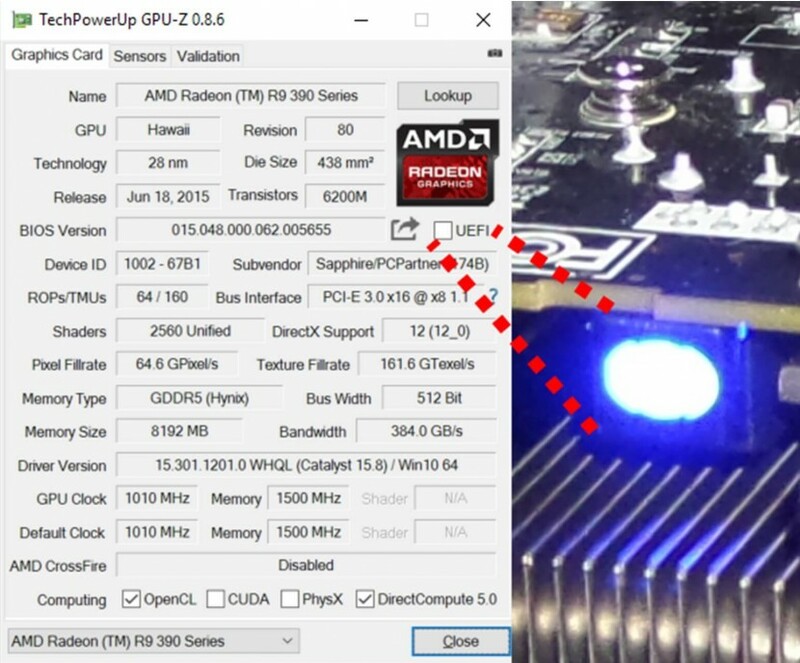 The Crimson version of AMD’s drivers is said to improve performance but only by a very small margin, maybe 2% but it should not make a 390 perform above its 390X both at stock and overclocked. Though from my testing and other reviews I have read, stock 390X paired against a stock 390, there is about a 5% difference, in favor of the 390X of course. I won’t tell you which one to get, you can decide that on your own, but seeing the performance differences, I would save the $100 or more and go for the 390, maybe save the $100 to get a second 390 to Crossfire them. A few things I would like to mention about this card. They did an amazing job thinking about the smallest things that others might have overlooked. The PCI-E power connections, if you notice here, the part where you squeeze if pointed upwards, rather than in a horribly inconvenient downward position like most other cards do. Sapphire here made it easy for people to plug and unplug those PCI-E power cables, it’s a small detail to mention, but the details are what make things great I think. Staying on the back of the card, they elongated the card a bit to fit in extra-long copper pipes and fins to keep things nice and cool. Which can be seen throughout the card. By the way, did you notice that little Sapphire logo there? Doesn’t make a whole lot of sense UEFI On having the light off and UEFI Off having the light on, kind of backwards I think. The reason for the UEFI feature is when it is on (the light being off) it allows for Microsoft’s Secure boot within Windows 8/8.1/10 to work with modern BIOS’ for more security locking out low level malware. Since UEFI is not really required though, you can turn it on or off. 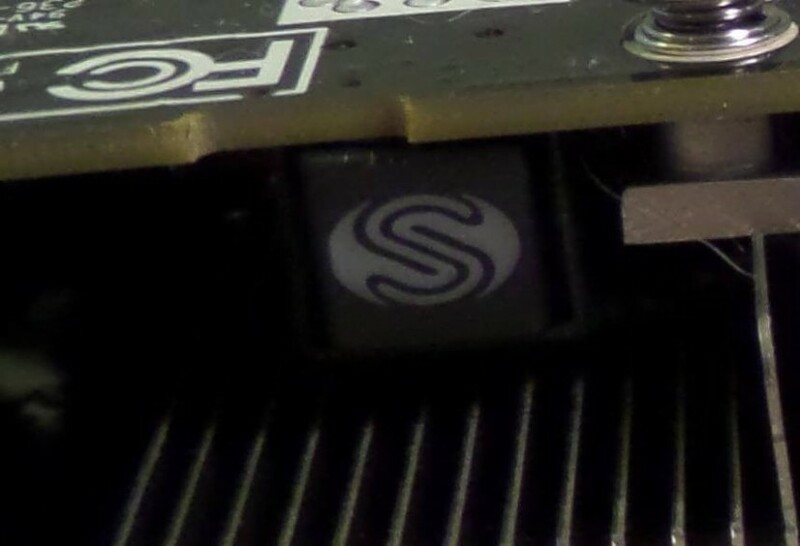 For legacy purposes, motherboards that do not UEFI support, Sapphire allows you to turn this feature off so that everyone can use it. So this card has a ton of nice features and an amazing price, there is only one tiny complaint, and for some it may not be a big deal, but for others it could cause a few days of waiting. Tons of ports to work for just about everyone. Extension solely for the purposes of cooling is a nice touch. The card reviewed here was slightly a slower card than what is linked in this review, the one in the link is actually cheaper, comes with a backplate and as 30Mhz faster, so you get a deal. Sapphire didn’t have any to send me, so they sent me the ones I have now, though as you saw works very well. 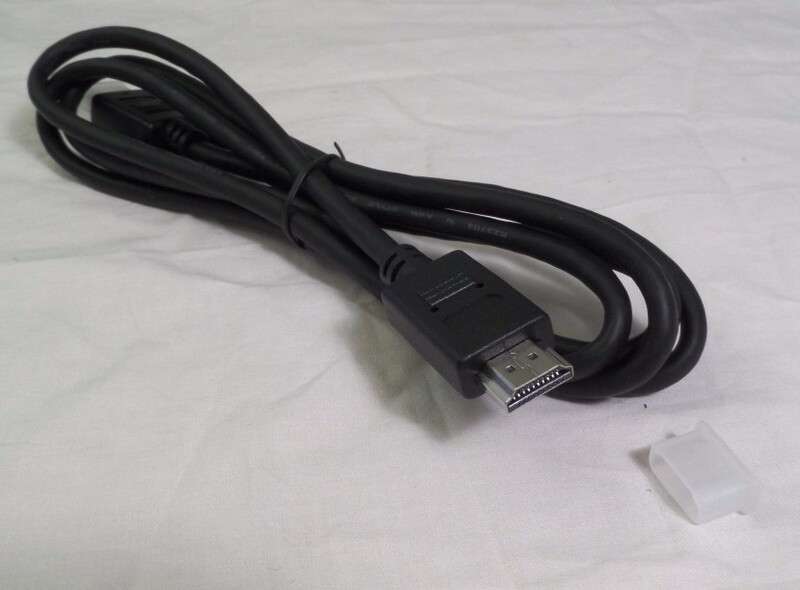 The missing PCI-E 6 pin to 8 Pin adapters is something that should have been included but I cannot discredit them too much for that, since it is dirt cheap to get. I want to give this a 4.5 because it is missing it, but the card is just that great and is very affordable and the fact that it can outperform a 390X with the basic cooling, makes it a 5 out of 5, highly recommended and an Editors Choice.